Kimberly Derting is the author of the Cece Loves Science series, the Body Finder series, the Pledge trilogy, and the Taking series. She lives in the Pacific Northwest, where the gloomy weather is ideal for writing anything dark and creepy. Her three beautiful (and often mouthy) children serve as an endless source of inspiration and frequently find things they say buried in the pages of their mother’s books. You can visit her online at www.kimberlyderting.com. 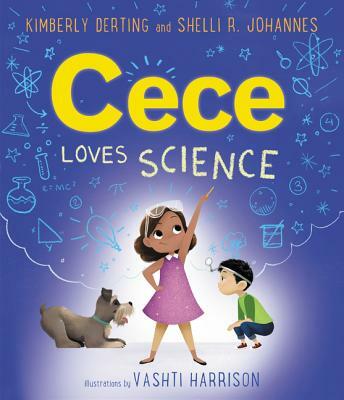 Vashti Harrison is the author-artist of the New York Times bestselling Little Leaders: Bold Women in Black History and the artist of the Cece Loves Science series. She earned her MFA in Film/Video from CalArts and BA from the University of Virginia. Her experimental films and documentaries have been shown around the world at film festivals. She lives in Brooklyn, NY. Shelli R. Johannes never warmed up to creepy crawly bugs, but she always loved zoology and biology. In fact, she can often be found on highways and country roads saving strays and other jaywalking critters, or volunteering with animal conservations groups like The Atlanta Zoo, The Dolphin Project, and animal rescue centers. Unfortunately, she learned early on that chemistry (a.k.a. cooking) was not her favorite science, often resulting in odd reactions and minor explosions. She lives in Atlanta with her husband, two kids, one bird, one fish, and two crazy-haired Doodles who, just like Einstein, all who seem to love fruit and dessert, but loathe veggies.